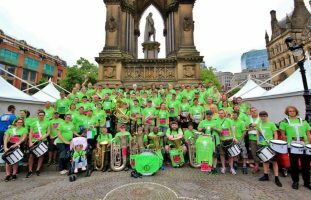 This weekend 70 brass banders will be marching with 16 year-old Brooke Taylor through the streets of Manchester as ‘Brooke’s Barmy Army’, hoping to raise £22,000 for the Royal Manchester Children’s Hospital (RMCH). Brooke has been a patient at Royal Manchester Children’s Hospital since the day she was born. Not only is she a patient but she is a keen fundraiser, raising thousands of pounds for the place she calls her second home. Brooke is a member of Pemberton ‘B’, Wigan Youth and the Greater Manchester Youth Brass bands and, in 2017, she came up with the wacky idea of marching the Manchester 10k with a brass band. ‘Brooke’s Barmy Army’ took to the streets only days after the Manchester Attack last year. A 60-strong band made up of Brooke’s friends, family and willing volunteers came forward when they heard her appeal and they completed the 6.2-mile route in just 2 hours 22 minutes, raising a massive £20k to fund reclining chairs on the hospital’s Paediatric Intensive Care Unit. The band had loads of fun last year, with new friendships formed. It was a real team effort and many members said it was one of the highlights of their banding career. Following a minute’s silence for the 22 lives that were lost in the Manchester Arena bombing, they played the hymn Abide With Me, which resulted in a roar of thousands across the city. Supporters on route were entertained with music such as Keep on Running, Is this the Way to Amarillo and Uptown Funk, and the band crossed the finish line playing Don’t Look Back in Anger. After winning last year’s JustGiving Fundraiser of the Year, Brooke decided she couldn’t leave it there. When the date of this year’s Manchester 10k was announced, Brooke asked her Barmy Army if they were up for the challenge again. Of course they were and so, on Sunday 20 May 2018, Brooke’s troops will take to the streets once more. More than 70 people have been recruited this year, with many reunited from the previous year, but lots of new faces have also joined the team. More that 20 bands from across Yorkshire and the North West will be represented, including Foden’s, Pemberton, Stockport Silver, Besses Boys, Mossley, Rivington and Adlington, Sale Brass, Dinnington Colliery, Eccles, Fairfield, VBS Poynton, Hammonds Saltaire, Shirebrook Miners Welfare, Elland Silver, Old Hall Brass, Diggle, Eccleston, Eagley, Hawk Green, Penrith Town, Pilling Jubilee Silver, Bolton Citadel Salvation Army and the Lancashire Artillery Band! This year Brooke would like to raise an ambitious £22k to fund a Blood Rapid Infuser, a project very relevant to last year’s Manchester Attack. Following the Manchester Arena bombing, children had life threatening injuries that needed large quantities of blood and blood products to be given very rapidly. It is very important to warm blood when transfusing it to reduce the chance of causing hypothermia, however, the fluid warming devices used daily are not designed for rapid infusion. The purchase of a Belmont Rapid Infuser RI-2 – a device used internationally including in military hospitals in Afghanistan – will enable warm blood rapid infusion, saving many lives. Brooke said of last year’s event, “I have never been so grateful of what the power of friendship can do. The brass band community has once again spread its wonderful spirit to help a cause so close to my heart and to help hundreds of people. I’m proud to say I’m from the brass band community and we couldn’t have done this incredible achievement if we didn’t have the tremendous support from everyone. I have been bowled over by the number of new people wanting to join the Barmy Army, and I’m sure their enthusiasm and commitment to the cause will enable us to hit this year’s ambitious target”.